Another addled and confused variation of the Holy Trinity: the description on the back of this print is "A Trinity of Teachers". From left to right, the Mother of God, Christ, and St Mary Magdalene. OYYY!!! I know I have posted one three-headed Trinity in this thread, but here's another one. And yes, the artist calls them icons. Scary, all right. I found it as a small mounted print at a charity stall. I paid a dollar for it, only to prevent some poor unsuspecting soul from buying it. My first intention was to burn it as soon as I got home, but I thought it better to at least photograph it for my schlock file first. I'll probably end up burning it eventually. Ok, this gets "2nd most scary looking" award following the monstrosity triple-face Novgorodian 'trinity.' The one LBK posted still might win "overall theologically most disturbing" category. Scary, all right. I found it as a small mounted print at a charity stall. I paid a dollar for it, only to prevent some poor unsuspecting soul from buying it. 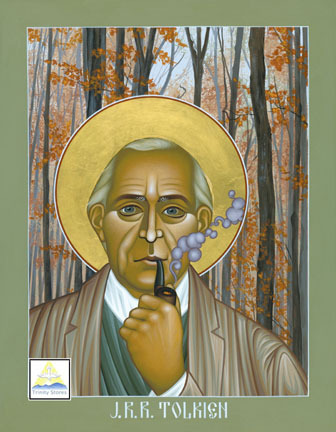 As a Tolkien fan it makes me cringe, as a Christian...words can't even describe. I think Tolkien would roll over in his grave if he ever saw this. There should be an asylum for the theologically disturbed. A haven and provision of healing for those poor souls who have suffered spiritual damage because of this stuff, a prison for chronic and repeat offenders who knowingly paint this stuff (including confiscation and prohibition of any artist's materials) for crimes against iconography, and a facility to educate those who have made mistakes in honest ignorance, and who truly wish to paint proper icons. Jude was a holy person! He repented after! He was even considered a saint! and the Gospol of Jude! I learned it on the History Channel, it must be true!!!!!!!! Gunnarr, this is not meant to be rude, but I must ask the same question as Shanghaiski. Are you posting about something on another thread and accidentally posted it here? IMO he is referring in a satirical way to the "icon" I've posted before. Yeah the History Channel part gave it away. Do pixels on a computer screen constitute an Icon? An intangible digital image is not an icon in the strict sense (so venerating a screen saver or desktop wallpaper isn't a great idea), but a digital image or file has the potential to become a real, tangible icon, as it can be printed (the invisible, immaterial God became tangible, visible - a central principle of the justification of the existence of icons) and then mounted or framed, making it suitable for veneration. However, the 'shopping of digital icons for humorous or other "creative" effect is unacceptable and disrespectful. No, you are not. It's especially troubling as there's contention, AFAIK, over just how vernacular Old Church Slavonic was. So what happened then? They made up a language to evangelise the Slavs and just made up a new language that no one actually understood? There definitely becomes a point where a written language may no longer be the vernacular, but it seems incredible it could start out that way. Not quite. My understanding is that Sts Cyril and Methodius standardized the writing of the prevailing Old Slavonic language prevalent at the time, by adapting the existing Greek alphabet. The relationship between Old Slavonic (the spoken language) and liturgical-use Church Slavonic is pretty close, from what I've gathered; it would have been much closer than, say, Church Slavonic and modern Russian. Well, considering whenever I use Slavonic, just about everybody Slavic tends to get the jist of what I'm saying- it's easier than communicating in Nadsat, anyway. ... though there are some hilarious pitfalls, too. Zhivot' in Church Slavonic means life, in modern Russian, it means stomach or belly. True. Though it's incredible difficult to go wrong with Gospoda, pomiluj! Thank you. My Glagolitic Alphabet self-translations are not that reliable. Saw this on Tumblr. I really like it for some reason, but is it schlock? 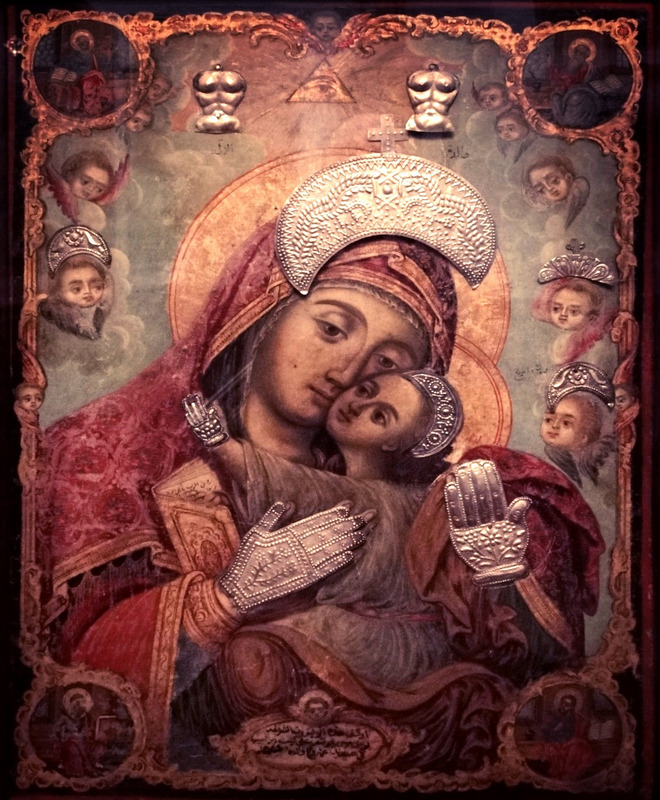 This image is an attempt to express the most-used kontakion to the Mother of God, To the Champion Leader (Ti Ypermakho Statigho/Vzbrannoy Voyevodye). The secondary inscription reads: стой за Христа до мученического креста, an exhortation to martyrdom. This image is problematic on a number of levels, including the attire of the Mother of God. Replacing her blue tunic and red maphorion with a warrior's helmet and chainmail removes a central representation of her humanity (blue) being graced by Divinity (red), which represents the mystery of the Incarnation. 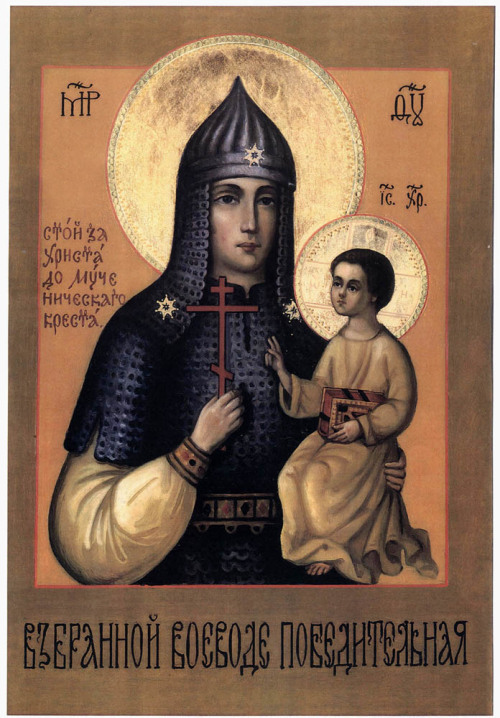 She is also holding a martyr's cross, which is also at odds with what we know of her earthly life, and what the Church proclaims in hymns and prayers to her. This image is one of various "innovative" images painted between the 17th and 20th centuries, which, at best, are misguided in their theology, at worst, are little more than expressions of nationalism/imperialism. Makes sense. I did notice the martyr's cross as not being coherent, but wasn't sure about the rest. At least it kept the stars of virginity. Oh Gospodi pomiluj! on us and all these artists! At least it kept the stars of virginity. Late impressionistic, I'd say. And the impression it gives of late is "heresy." You're kidding, right? I've known twelve-year-olds whose draftsmanship was superior. This is the strangest riza I've sever seen... Are those torsos flying in the sky? I've seen youtube videos of 5 year olds playing the piano, guitar, etc. who are playing things some professional musicians can't play. Doesn't mean the professional musicans are worthless. This is the strangest riza I've sever seen... Are those ripped-abs torsoes flying in the sky? No, they're not. They are votive tokens, put on the icon either to ask for healing through prayer to the Mother of God, or in gratitude for prayers answered. These pressed-metal tokens come in a variety of forms, including hands, eyes, legs, and whole bodies. This custom seems to be far more prevalent among Greeks and Orthodox from the Balkans, less so with Russians. The Greek word for these offerings is tamata, singular tama (vow). Had no idea - thanks! I really should've titled this thread something like "LBK's Musings on Schlock and Unusual Icons." 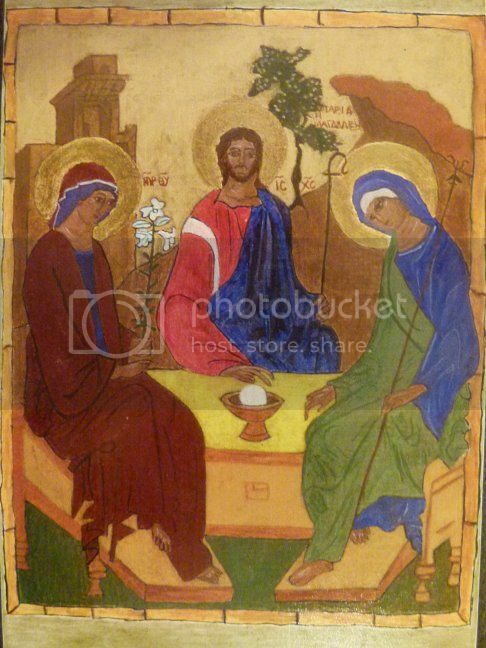 I seriously doubt this "Trinity of Teachers" was painted by a properly-trained artist, let alone an iconographer. I've seen far too much of this sort of stuff over the years to know that it is the work of someone who not only can't paint, but has painted a theologically worthless and spiritually dangerous work, whether in knowledge or in ignorance. The former is the lesser error, the latter is completely unacceptable. 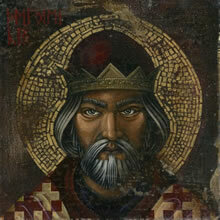 I have many icons on file that are "rough" or "rustic" in execution, but are full of spiritual power and authenticity. This "trinity" is not one of them.